True North Sports + Entertainment employees do a lot of work behind the scenes to make sure that Winnipeg Jets and Manitoba Moose fans can enjoy hockey in Winnipeg. On August 23, they took a different approach to ensuring the success and future of hockey. 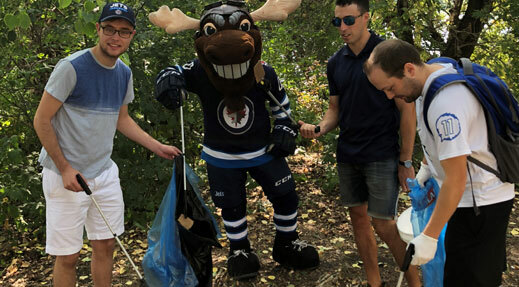 Instead of selling tickets, or working on marketing plans, True North employees stepped outside the office to launch a new park cleanup initiative at Stephen Juba Park to ensure the future of hockey from an ecological standpoint. True North partnered with the Manitoba Eco-Network for the initiative. After receiving a quick lesson on why caring for the environment is important, employees scoured the park, filling garbage bags and bins with litter and trash found on the downtown shores of the Red River. The cleanup was part of the Winnipeg Jets Go Green campaign, which promotes the responsibility of True North in protecting our planet as part of the NHL’s overarching Green initiative. NHL Green is committed to protecting the places we play hockey by using innovative technologies to transform the hockey business, and inspiring communities and partners to lower emissions, conserve water, reduce waste, and generally do their part to help our planet. In one hour of cleaning up the park, 20 True North employees were able to pick up 50 lbs of garbage and recycling. Items picked up included 171 cigarette butts, 69 pieces of cardboard, 37 plastic bottles, 34 food wrappers, 23 plastic bags, and much more. For True North employee Susan Olson, the Go Green initiative is something that is well worth her time. Though caring for the earth was the main goal of the program, team bonding for True North employees served as a great by-product of the cleanup. The Winnipeg community got a chance to get in on the action as well on August 25 at St. Vital Park, as the cleanup initiative continued. The public will have one more chance to get involved on Saturday, Sept. 8 at 11 a.m. when the initiative will move to Omand’s Creek. Volunteers will meet in the southwest corner of the Home Depot parking lot at 727 Empress Street. Whether community members show up because they are hockey fans and care about the future of the game, or because they care about their city and its condition doesn’t matter to Bezte. What matters is the fact that people are cleaning up and being responsible. Find out more about how True North Sports + Entertainment is going green at winnipegjets.com/green. The Winnipeg Jets Go Green game is on Thursday, Mar. 14 vs. the Boston Bruins. To learn more about the NHL’s Green Month visit NHL.com/green, or visit winnipegjets.com/tickets for tickets.